Proxy minions are a developing Salt feature that enables controlling devices that, for whatever reason, cannot run a standard salt-minion. Examples include network gear that has an API but runs a proprietary OS, devices with limited CPU or memory, or devices that could run a minion, but for security reasons, will not. Proxy minions are not an "out of the box" feature. Because there are an infinite number of controllable devices, you will most likely have to write the interface yourself. Fortunately, this is only as difficult as the actual interface to the proxied device. Devices that have an existing Python module (PyUSB for example) would be relatively simple to interface. Code to control a device that has an HTML REST-based interface should be easy. Code to control your typical housecat would be excellent source material for a PhD thesis. 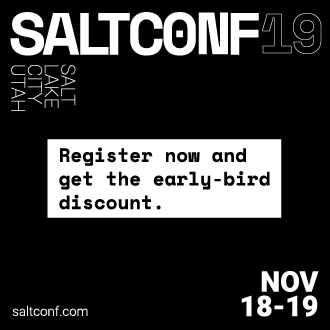 Salt proxy-minions provide the 'plumbing' that allows device enumeration and discovery, control, status, remote execution, and state management. See the Proxy Minion Walkthrough for an end-to-end demonstration of a working REST-based proxy minion. See the Proxy Minion SSH Walkthrough for an end-to-end demonstration of a working SSH proxy minion. See Proxyminion States to configure and run salt-proxy on a remote minion. Specify all your master side proxy (pillar) configuration and use this state to remotely configure proxies on one or more minions. See Proxyminion Beacon to help with easy configuration and management of salt-proxy processes. The proxy_merge_grains_in_module configuration variable introduced in 2016.3, has been changed, defaulting to True. The connection with the remote device is kept alive by default, when the module implements the alive function and proxy_keep_alive is set to True. The polling interval is set using the proxy_keep_alive_interval option which defaults to 1 minute. The developers are also able to use the proxy_always_alive, when designing a proxy module flexible enough to open the connection with the remote device only when required. Proxy minions now support configuration files with names ending in '*.conf' and placed in /etc/salt/proxy.d. Proxy minions can now be configured in /etc/salt/proxy or /etc/salt/proxy.d instead of just pillar. Configuration format is the same as it would be in pillar. The deprecated config option enumerate_proxy_minions has been removed. As mentioned in earlier documentation, the add_proxymodule_to_opts configuration variable defaults to False in this release. This means if you have proxymodules or other code looking in __opts__['proxymodule'] you will need to set this variable in your /etc/salt/proxy file, or modify your code to use the __proxy__ injected variable. The __proxyenabled__ directive now only applies to grains and proxy modules themselves. Standard execution modules and state modules are not prevented from loading for proxy minions. The try/except block above exists because grains are processed very early in the proxy minion startup process, sometimes earlier than the proxy key in the __opts__ dictionary is populated. Then the grain ip will contain the result of calling the get_ip() function in the proxymodule called proxymodulename. Proxy modules now benefit from including a function called initialized(). This function should return True if the proxy's init() function has been successfully called. This is needed to make grains processing easier. Finally, if there is a function called grains in the proxymodule, it will be executed on proxy-minion startup and its contents will be merged with the rest of the proxy's grains. Since older proxy-minions might have used other methods to call such a function and add its results to grains, this is config-gated by a new proxy configuration option called proxy_merge_grains_in_module. This defaults to True in the 2017.7.0 release. BREAKING CHANGE: Adding the proxymodule variable to __opts__ is deprecated. The proxymodule variable has been moved a new globally-injected variable called __proxy__ . A related configuration option called add_proxymodule_to_opts has been added and defaults to True . In the next major release, 2016.3.0, this variable will default to False. In the meantime, proxies that functioned under 2015.8.0 and .1 should continue to work under 2015.8.2. You should rework your proxy code to use __proxy__ as soon as possible. The rest_sample example proxy minion has been updated to use __proxy__ . This change was made because proxymodules are a LazyLoader object, but LazyLoaders cannot be serialized. __opts__ gets serialized, and so things like saltutil.sync_all and state.highstate would throw exceptions. Support has been added to Salt's loader allowing custom proxymodules to be placed in salt://_proxy. Proxy minions that need these modules will need to be restarted to pick up any changes. A corresponding utility function, saltutil.sync_proxymodules, has been added to sync these modules to minions. Starting with the 2015.8 release of Salt, proxy processes are no longer forked off from a controlling minion. Instead, they have their own script salt-proxy which takes mostly the same arguments that the standard Salt minion does with the addition of --proxyid. This is the id that the salt-proxy will use to identify itself to the master. Proxy configurations are still best kept in Pillar and their format has not changed. This change allows for better process control and logging. Proxy processes can now be listed with standard process management utilities (ps from the command line). Also, a full Salt minion is no longer required (though it is still strongly recommended) on machines hosting proxies. The key thing to remember is the left-most section of the diagram. Salt's nature is to have a minion connect to a master, then the master may control the minion. However, for proxy minions, the target device cannot run a minion. After the proxy minion is started and initiates its connection to the device, it connects back to the salt-master and for all intents and purposes looks like just another minion to the Salt master. The proxy_connection_module (located in salt/proxy). The grains support code (located in salt/grains). Salt modules specific to the controlled device. Salt states specific to the controlled device. Proxy minions require no configuration parameters in /etc/salt/master. Note the contents of each minioncontroller key may differ widely based on the type of device that the proxy-minion is managing. net-devices 1, 2, and 3 are network switches that have a management interface available at a particular IP address. i2c-devices 4 and 5 are very low-level devices controlled over an i2c bus. In this case the devices are physically connected to machine 'minioncontroller2', and are addressable on the i2c bus at their respective i2c addresses. 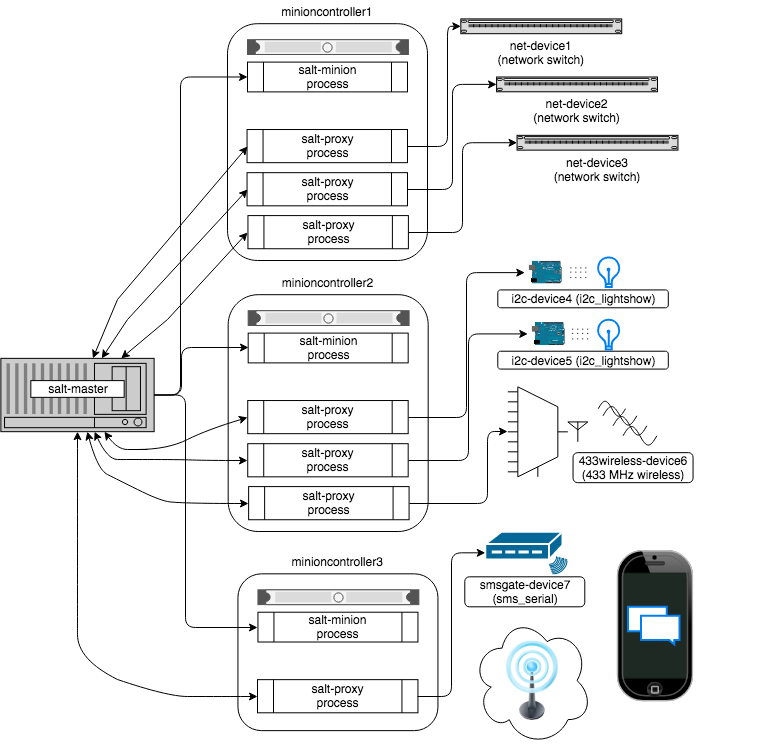 smsgate-device7 is an SMS gateway connected to machine minioncontroller3 via a serial port. Because of the way pillar works, each of the salt-proxy processes that fork off the proxy minions will only see the keys specific to the proxies it will be handling. Proxies can be configured in /etc/salt/proxy or with files in /etc/salt/proxy.d as of Salt's 2016.11.0 release. Also, in general, proxy-minions are lightweight, so the machines that run them could conceivably control a large number of devices. To run more than one proxy from a single machine, simply start an additional proxy process with --proxyid set to the id to which you want the proxy to bind. It is possible for the proxy services to be spread across many machines if necessary, or intentionally run on machines that need to control devices because of some physical interface (e.g. i2c and serial above). Another reason to divide proxy services might be security. In more secure environments only certain machines may have a network path to certain devices. __virtual__(): This function performs the same duty that it does for other types of Salt modules. Logic goes here to determine if the module can be loaded, checking for the presence of Python modules on which the proxy depends. Returning False will prevent the module from loading. init(opts): Perform any initialization that the device needs. This is a good place to bring up a persistent connection to a device, or authenticate to create a persistent authorization token. initialized(): Returns True if init() was successfully called. shutdown(): Code to cleanly shut down or close a connection to a controlled device goes here. This function must exist, but can contain only the keyword pass if there is no shutdown logic required. ping(): While not required, it is highly recommended that this function also be defined in the proxymodule. The code for ping should contact the controlled device and make sure it is really available. alive(opts): Another optional function, it is used together with the proxy_keep_alive option (default: True). This function should return a boolean value corresponding to the state of the connection. If the connection is down, will try to restart (shutdown followed by init). The polling frequency is controlled using the proxy_keep_alive_interval option, in minutes. grains(): Rather than including grains in /srv/salt/_grains or in the standard install directories for grains, grains can be computed and returned by this function. This function will be called automatically if proxy_merge_grains_in_module is set to True in /etc/salt/proxy. This variable defaults to True in the release code-named 2017.7.0. Pre 2015.8 the proxymodule also must have an id() function. 2015.8 and following don't use this function because the proxy's id is required on the command line. Here is an example proxymodule used to interface to a very simple REST server. Code for the server is in the salt-contrib GitHub repository. This proxymodule enables "service" enumeration, starting, stopping, restarting, and status; "package" installation, and a ping. # across calls to fns in here. # entry when the module is loaded. # else needs to be done. This function returns a flag with the connection state. via a channel that requires a more elaborated keep-alive mechanism, e.g. Call the REST endpoint to see if the packages on the "server" are up to date. Is the REST server up? Grains are data about minions. Most proxied devices will have a paltry amount of data as compared to a typical Linux server. By default, a proxy minion will have several grains taken from the host. Salt core code requires values for kernel, os, and os_family--all of these are forced to be proxy for proxy-minions. To add others to your proxy minion for a particular device, create a file in salt/grains named [proxytype].py and place inside it the different functions that need to be run to collect the data you are interested in. Here's an example. Note the function below called proxy_functions. It demonstrates how a grains function can take a single argument, which will be set to the value of __proxy__. Dunder variables are not yet injected into Salt processes at the time grains are loaded, so this enables us to get a handle to the proxymodule so we can cross-call the functions therein used to commmunicate with the controlled device. Note that as of 2016.3, grains values can also be calculated in a function called grains() in the proxymodule itself. This might be useful if a proxymodule author wants to keep all the code for the proxy interface in the same place instead of splitting it between the proxy and grains directories. This function will only be called automatically if the configuration variable proxy_merge_grains_in_module is set to True in the proxy configuration file (default /etc/salt/proxy). This variable defaults to True in the release code-named 2017.7.0. In previous versions of Salt the __proxyenabled__ directive controlled loading of all Salt modules for proxies (e.g. grains, execution modules, state modules). From 2016.3 on, the only modules that respect __proxyenabled__ are grains and proxy modules. These modules need to be told which proxy they work with. __proxyenabled__ is a list, and can contain a single '*' to indicate a grains module works with all proxies. See above for a general introduction to writing proxy modules. All of the guidelines that apply to REST are the same for SSH. This sections specifically talks about the SSH proxy module and explains the working of the example proxy module ssh_sample. Here is a simple example proxymodule used to interface to a device over SSH. Code for the SSH shell is in the salt-contrib GitHub repository. This proxymodule enables "package" installation. a server that exposes functionality via SSH. an api over HTTP and doesn't have the python stack to run a minion. Can be used to initialize the server connection. The init() method is responsible for connection setup. It uses the host, username and password config variables defined in the pillar data. The prompt kwarg can be passed to SSHConnection if your SSH server's prompt differs from the example's prompt (Cmd). Instantiating the SSHConnection class establishes an SSH connection to the ssh server (using Salt VT). The package_* methods use the SSH connection (established in init()) to send commands out to the SSH server. The sendline() method of SSHConnection class can be used to send commands out to the server. In the above example we send commands like pkg_list or pkg_install. You can send any SSH command via this utility. Output returned by sendline() is a tuple of strings representing the stdout and the stderr respectively. In the toy example shown we simply scrape the output and convert it to a python dictionary, as shown in the parse method. You can tailor this method to match your parsing logic. The shutdown method is responsible for calling the close_connection() method of SSHConnection class. This ends the SSH connection to the server. For more information please refer to class SSHConnection.